Ummmmm ya that sounds crazy because it is!!! This type of transformation is definitely not possible in just 3 weeks! (Not in a healthy sustainable way anyways). The truth is, this is actually a 12 MONTH TRANSFORMATION! To be honest, it’s YOU that does the work. My role as your trainer is to guide you, keep you accountable, enforce consistency, provide you with a safe and effective personal plan from all of the education, time and experience I have invested in etc…. YES, all of those things take work, but the real work and CHANGE starts with you! Sometimes we don’t want to hear that, because then we have to blame ourselves if we don’t succeed, but how amazing is it, to know that this is totally POSSIBLE and that you can CELEBRATE and CONGRATULATE yourself when you do succeed. This is exactly what I had the privilege of witnessing over the past twelve months with my client. The first thing that happened, was that she had ENOUGH of not feeling like herself, ENOUGH of not fitting into her clothes comfortably, ENOUGH of not feeling confident, ENOUGH of being too scared to take the first step. Do any of these things sound familiar to you? She did it by still feeling all of those things and taking the first step anyways. It was not easy. Not just the physical stuff. She told me later that it was hard to admit to herself where she had allowed herself to go. It was hard to admit that she couldn’t do it on her own and that she needed help. I remember looking at her demeanor in those first sessions, the sadness, the nerves, the defeat that was written all over her face. She still showed up every week (twice, even 3 times some weeks). She communicated with me and asked questions about her nutrition and made small manageable changes that were achievable and helped her to not feel like she was on a diet or depriving herself. 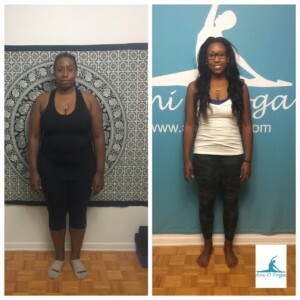 Within the first couple of months there were significant changes (we built up her strength with yoga and body weight/strength training), I could see the changes, not only in her body, but also in her attitude and body language. She was starting to look more confident in her movements, she looked happier. Instead of giving you a quote about what she has to say about training with me, I felt like I just had to share my thoughts and perspective as her trainer. What a cool and powerful thing to witness! This transformation of not just body, but transformation of mind, of habits, of routines. I watched her as she told me stories about the ability to join her staff softball league, about the cute pair of pants she was able to buy for an event she had to attend. These are the things that bring joy, love, and passion for what I do! She did it by changing herself! 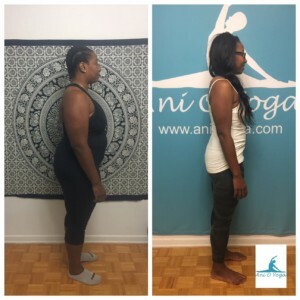 It was not always a smooth road, but 12 months was just enough time for her to make the necessary adjustments in her life, in order to achieve such an exceptional transformation. Congratulations lady! I couldn’t be more proud of what YOU’VE done! In the winter season that is fast approaching, consider what your goals and what steps you will take to make them happen. I would love to be a part of that. Reply to ani@anioyoga.com to tell me how I can help!